We are hours away from Marathon Monday, also known as the Boston Marathon. Tomorrow morning, tens of thousands of runners will gather in Hopkinton, MA and make their way to downtown Boston. If you’re lucky enough to be in Boston, here are estimates of where front of the pack will be throughout the morning. There will be live local coverage on WBZ-TV if you’re in the Boston Area, and live nationwide coverage on NBC Sports. 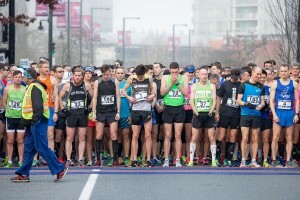 Canadians can find the marathon on Runnerspace or NBC Sports Gold. The event is also live on TSN2. 2019 B.A.A 5K. Photo: Alan Brookes. Flosports is streaming the event in most European countries. It’s a subscription-based service. Don’t care so much about the lead pack? Find your favourite runner here and track their progress through the course. And of course you can also follow Canadian Running on Twitter and Instagram for updates from the event.